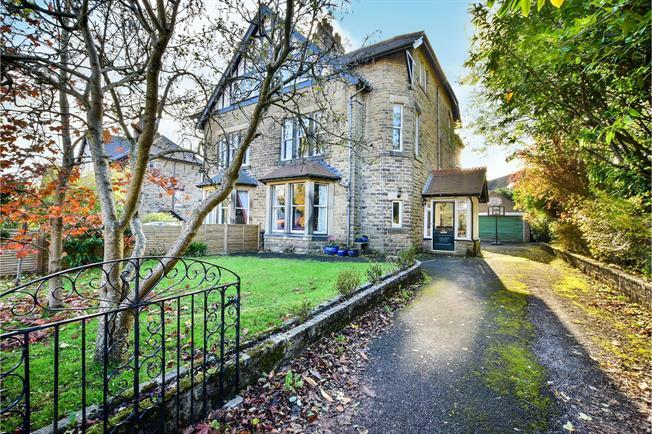 5 Bedroom Semi Detached House For Sale in Buxton for Asking Price £400,000. Blending period features with modernised fixtures and fittings this spacious and versatile semi-detached property is a must see for growing and established families alike. Set on a generous plot including ample off road parking, a detached double garage and gardens to the front and rear the property itself offers a flexible arrangement of bedrooms and reception space over three floors plus a very useful lower ground floor basement area with two cellar chambers. A ground floor porch opens to the entrance hall with lobby to front, a large bay fronted living room, a dining room and a kitchen, whilst to the first floor there is a large sitting room/master bedroom, a double bedroom and a shower room with three more bedrooms and a bathroom on the second floor above. There are some very distinguishing period features including the original staircase and original coving that are most visual in the living room, the hall and lobby and the first floor sitting room/bedroom and other features include gas central heating throughout and partial uPVC double glazing. Viewing is highly recommended. Entrance door, windows to the front, side and rear, a tiled floor and a leaded and stained glass door into the hall. Sash window facing the side, a double radiator, original coving, a spindle staircase to the first floor, open plan to the lobby and doors to the living room, dining room, kitchen and basement. Double glazed uPVC window facing the front, a double radiator and original coving with an ornate archway. Bay window facing the front, vertically hung radiators and an open fire with a cast-iron grate, stone hearth and a stone fireplace surround, a picture rail, original coving and wall lights. UPVC double glazed double doors opening onto the rear patio, a double radiator, engineered wood flooring and built-in storage cupboards. Comprising wall and base units, roll top work surfaces with an inset one and a half bowl sink with mixer tap and drainer, space for a range oven with over hob extractor, space for a dishwasher and space for a fridge/freezer. UPVC double glazed door to side opening onto the patio, a double glazed uPVC window facing the side, a double radiator, tiled flooring and tiled splashbacks. With an additional storage area. Sash uPVC double glazed window to side, separate original sash window facing the side, a double radiator, a spindled balustrade and returning spindled staircase to the second floor landing. Double glazed uPVC sash windows facing the front and side, a living flame effect gas fire with fireplace surround, double radiator and original coving. Double glazed uPVC window facing the rear, a double radiator and a feature fireplace. Double enclosure shower with thermostatic shower over and a pedestal wash hand basin. Double glazed uPVC window with frosted glass facing the rear, a double radiator, a built-in storage cupboard and downlights. Close coupled WC, a wash hand basin and a uPVC double glazed window to the side. Double glazed uPVC window facing the rear and a double radiator. Double glazed uPVC window facing the front, a double radiator and an exposed brick wall. UPVC double glazed window to the side and a radiator.